The existing surface is prepared by removing the pot holes or rust if any. The irregularities are filled in with premix chippings at least a week before laying surface course. If the existing pavement is extremely way, a bituminous leveling course of adequate thickness is provided to lay a bituminous concrete surface course on a binder course instead of directly laying it on a WBM. It is desirable to lay AC layer over a bituminous base or binder course. A tack coat of bitumen is applied at 6.0 to 7.5 kg per 10 sq.m area, this quantity may be increased to 7.5 to 10 kg for non-bituminous base. The premix is prepared in a hot mix plant of a required capacity with the desired quality control. The bitumen may be heated up to 150 – 177 deg C and the aggregate temperature should not differ by over 14 deg C from the binder temperature. The hot mixed material is collected from the mixture by the transporters, carried to the location is spread by a mechanical paver at a temperature of 121 to 163 deg C. the camber and the thickness of the layer are accurately verified. The control of the temperatures during the mixing and the compaction are of great significance in the strength of the resulting pavement structure. A mix after it is placed on the base course is thoroughly compacted by rolling at a speed not more than 5km per hour. 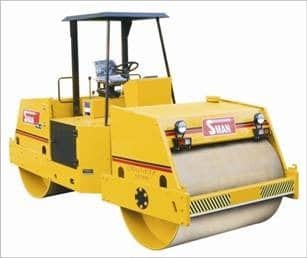 The initial or break down rolling is done by 8 to 12 tonnes roller and the intermediate rolling is done with a fixed wheel pneumatic roller of 15 to 30 tonnes having a tyre pressure of 7kg per sq.cm. the wheels of the roller are kept damp with water. The number of passes required depends on the thickness of the layer. In warm weather rolling on the next day, helps to increase the density if the initial rolling was not adequate. The final rolling or finishing is done by 8 to 10 tonne tandem roller. The routine checks are carried out at site to ensure the quality of the resulting pavement mixture and the pavement surface. 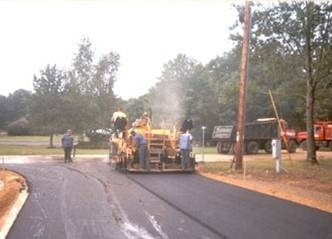 d) Temperature of paving mix during mixing and compaction. At least one sample for every 100 tonnes of the mix discharged by the hot mix plant is collected and tested for above requirements. Marshall tests are also conducted. For every 100 sq.m of the compacted surface, one test of the field density is conducted to check whether it is at least 95% of the density obtained in the laboratory. The variation in the thickness allowed is 6mm per 4.5m length of construction. The AC surface should be checked by a 3.0 m straight edge. The longitudinal undulations should not exceed 8.0 mm and the number of undulations higher than 6.0 mm should not exceed 10 in a length of 300 m. The cross-traffic profile should not have undulations exceeding 4.0mm.